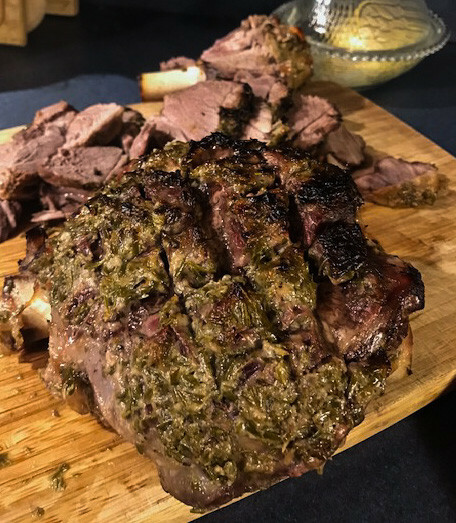 A simple recipe for whole roasted leg of lamb. Your easy elegant Easter Dinner! Take your whole leg of Lamb and score the fat/membranes in a criscross pattern about 1/8th of an inch deep. (optional) Grind fresh pepper over the top to taste. Let stand at room temperature 25 minutes. Roast lamb in middle of a 350°F. oven until an instant-read thermometer inserted 2 inches into thickest part of meat (do not touch bone) registers 130°F, approximately 1 1/2 to 1 3/4 hours. Save your juices to serve with the lamb or add to your mashed potatoes!